Moto G 4G LTE now available for purchase for just $219! The Moto G continues to be one of the most popular devices world-wide. In fact, it is Motorola’s most sold smartphone ever made! It came as no surprise that Motorola would release a worthy successor. Announced just about a month ago, the Moto G 4G LTE promises the same performance, build quality and more, for an unbeatable $219 price. We didn’t have to wait much before seeing the device going live. The Moto G 4G LTE has just become available for purchase straight from Motorola’s website. It was available on Amazon for some time, but the device has just now become available direct from Motorola. There are not many differences between the original Moto G and the Moto G 4G LTE. The main improvement is the addition of 4G LTE antennas (of course). Internal storage has also been limited to just 8 GB, but Motorola makes up for it by adding the highly-acclaimed microSD card slot. The device supports microSD cards of up to 32 GB. And just in case you haven’t been putting much attention to this device, it is very capable. The affordable handset carries a 4.5-inch 720p display, a 1.2 GHz quad-core Qualcomm Snapdragon 400 processor, 1 GB of RAM, 5 MP/1.3 MP cameras and a 2070 mAh battery. This is far from being a bad deal, guys! Motorola’s advantages extend far beyond what you originally get, though. Let’s not forget how well the Manufacturer has been doing at pushing the latest updates. 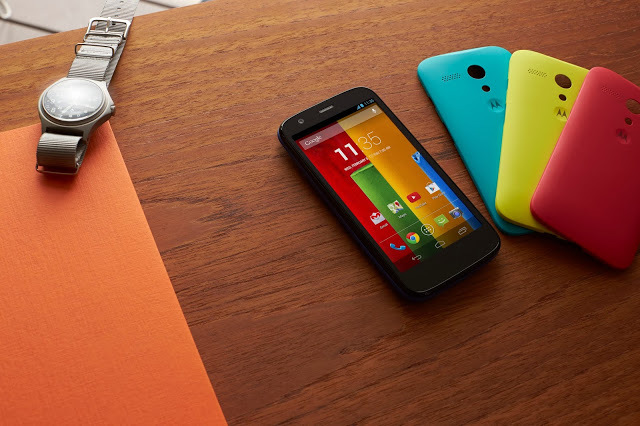 In fact, the Moto G was among the first phones in the world to get Android 4.4.3, even beating some Nexus devices. In addition to this, Motorola does offer a service that is very similar to HTC Advantage. They will repair a broken screen once, if the device was purchased straight from Motorola. Any other repairs will come with an attached $175 fee. It’s always good to see how good a phone is before purchasing, so make sure to check out our full review of the original Moto G. The differences mentioned above are not many, so you can get an idea of the Moto G 4G LTE with the post linked right above. You can go ahead and purchase the Moto G 4G LTE straight from Motorola’s site, if you are looking for a good $219 smartphone. You can also get it from Amazon.com, which we have linked right below. They also have a plethora of colorful cases and accessories, so go check them out!